"The Amazon Rainforest ecosystems are vital lungs of the Earth. Thus, the justice and well-being for the people of Sarayaku is inseparably tied to the fate of all people worldwide." As we face the daunting reality of the climate crisis unraveling all around us, including the recent Intergovernmental Panel on Climate Change (IPCC) report, which warns that we only have a dozen years remaining to radically change our current trajectory to prevent disastrous ecological and social harms, there is a shimmer of light and hope radiating out from the heart of the Ecuadorian Amazon sparked by the Kichwa People of Sarayaku. Sarayaku leaders launched their historic Kawsak Sacha or Living Forest Declaration in July this year during four days of public events, educational activities and ceremonies in the capital city Quito, Ecuador. The inauguration included a formal presentation to the Ecuadorian government and to international organizations and dignitaries. The goal of the Kawsak Sacha Declaration is to attain national and international recognition of a new legal category for the permanent protection of Indigenous lands. Rather than a worldview that only sees nature as a resource, the Declaration recognizes the intrinsic physical and spiritual relationship between the Peoples of the Living Forest, and all the beings that inhabit and compose it. Kawsak Sacha is a vision, worldview, and strategy, which presents all at once an ecological, political, cultural, spiritual and economic analysis, together with an ancient but new way forward to address living in a healthy and just world beyond capitalistic views of progress, development and conservation. Studies by the United Nations as well as many institutions have determined that the most effective way to protect forests and biodiversity, and thus help mitigate climate catastrophe, is by supporting Indigenous Peoples rights, lands and Traditional Ecological Knowledge. And yet, no international designation for conservation currently exists that recognizes the unique relationship between Indigenous peoples and the forest. The Living Forest Declaration represents many years of work and advocacy, and proposes the protection of the Kichwa way of life, including emphasis on uncontaminated rivers, sovereign communities, and a mandate that their territory be permanently free of any type of extractive activity such as oil exploitation, mining, logging or biopiracy. The Declaration also contends that Sarayaku's territory is subject to legal rights and demands that these rights be upheld. In 2008, Ecuador adopted Rights of Nature into their constitution to recognize and thereby award legal rights to nature, consequently, the Declaration is legally aligned with the Ecuadorian constitution. Living Way of Flowers project, now underway. With this project, Sarayaku is planting native flowering trees and plant species along the boundary of their 333,000-acre territory to symbolically and geographically demarcate their lands, and to convey the delicate nature of life and the fertility of the Living Forest. 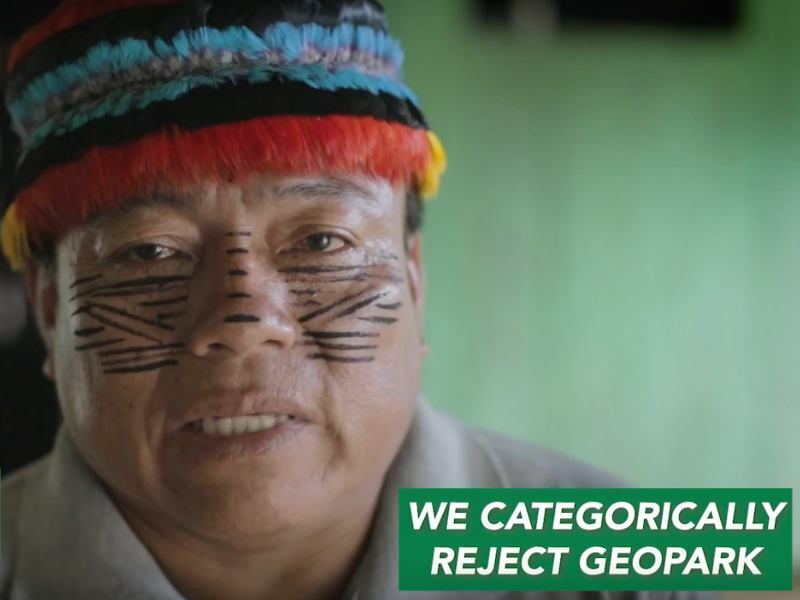 As the Sarayaku have made clear, the systems of natural protected areas created thus far by the Ecuadorian state and international organizations do not result in full consultation, participation or consent of Indigenous Peoples. These systems are not a solution, and in fact degrade and violate basic indigenous rights to autonomy and sovereignty. The Declaration's inauguration was coordinated to coincide with the sixth anniversary of the historic ruling of the Inter-American Court of Human Rights. In 2012 the Court found that the Ecuadorian Government violated the rights of the Sarayaku people in allowing an oil company into their territory without consultation or consent. This ruling has been an important victory for the community, but one that requires tireless vigilance to uphold. 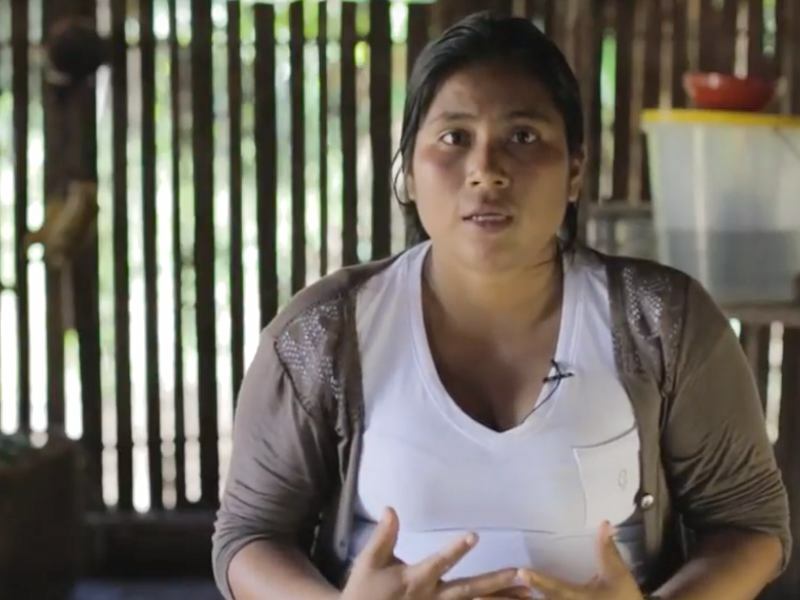 And vigilant they are – Sarayaku's powerful efforts against oil extraction over recent years have already kept an estimated 100 million barrels of oil in the ground and protected primary rainforest in their territories. With all this in mind, their bold leadership clearly demonstrates why the Kichwa people of Sarayaku are also known as the “Pueblo del Medio Dia,” or people of the Zenith. This acknowledgement originates from an ancestral prophecy stating that during a time of difficulty, Sarayaku would be a center of strength for territorial, cultural, and spiritual defense, a beacon of light as powerful as the noonday sun at its zenith. The Amazon Rainforest ecosystems are vital lungs of the Earth. Thus, the justice and well-being for the people of Sarayaku is inseparably tied to the fate of all people worldwide. 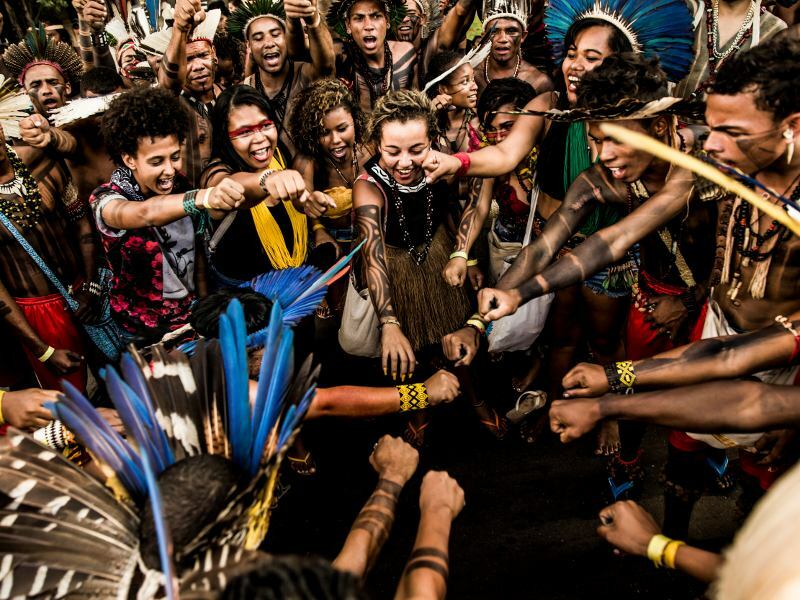 Furthermore, in the context of the global struggle for climate solutions, Indigenous rights, forest and biodiversity protection, and keeping fossil fuels in the ground, the Living Forest Declaration could not be more necessary. 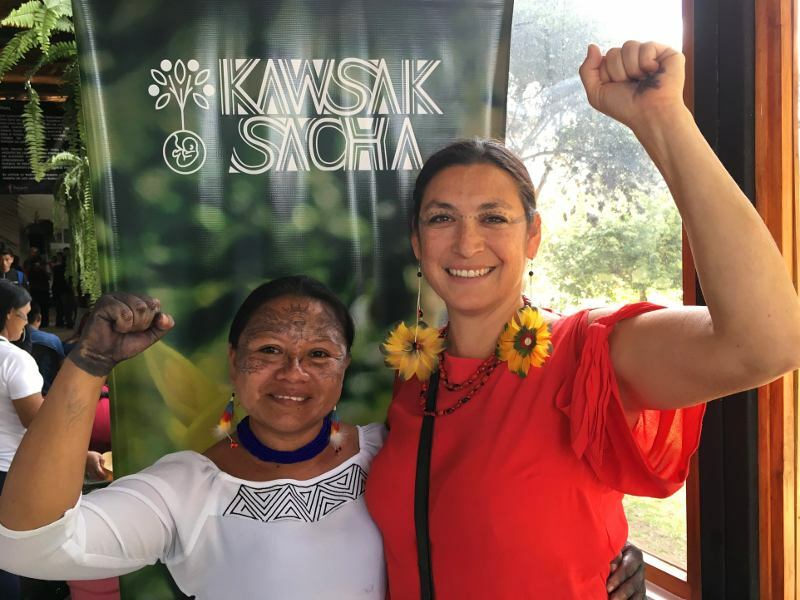 Kawsak Sacha is indeed part of a pillar of light as strong as the midday sun – a brilliant multifaceted vision – that needs to be respected by the Ecuadorian government, made-known around the world, and replicated to protect other Indigenous territories globally. The Women's Earth and Climate Action Network (WECAN) International was thankful to be present at the launch in Quito along with other International allies including Amazon Watch, Indigenous Environmental Network and Pachamama Alliance, as part of an important demonstration of international support for the vision and demands set forth by Kawsak Sacha leaders. 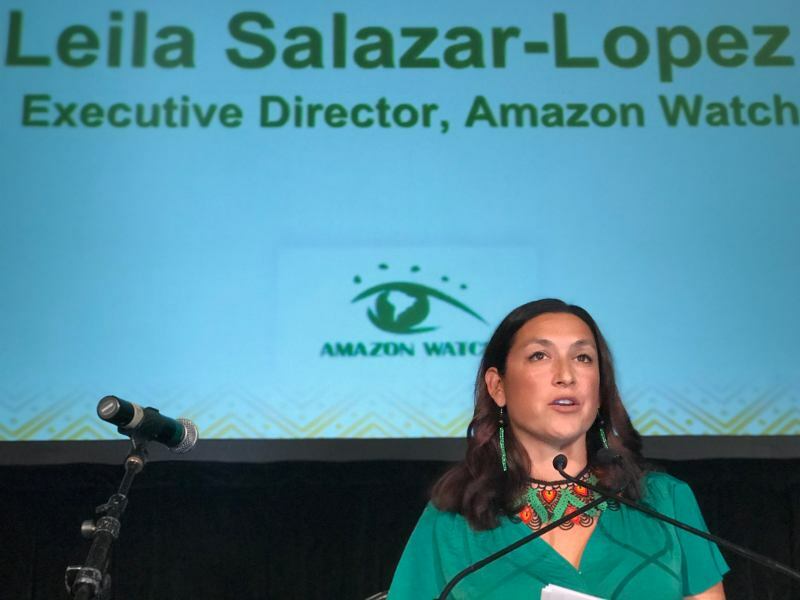 During the proceedings, along with Amazon Watch, WECAN was also honored to participate in a panel with Indigenous women of the Ecuadorian Amazon to emphasize the connection between extractivism and exploitation of women and the land that is inherent in patriarchal and colonial systems of oppression. In solidarity with this crucial initiative, WECAN interviewed women of Sarayaku to learn firsthand about the Living Forest Declaration. These frontline leaders explained that only through women uniting together will the Amazon be protected. To that end, a collective of Amazonian Women has organized over the past years to defend their ancient rainforests. Inspiring and effective as their work is, it needs to be highlighted that their bold stand is also perilous – throughout the launch events, women conveyed tragic and heart-rending stories of how they are increasingly being attacked for their resistance efforts to defend their territories – including through criminalization, death threats, property harms, and sexual violence. Nevertheless, in the face of egregious violations, the women made it clear that they stand strong – determined and courageous in their ceaseless efforts to protect and defend their territories and future generations. We offer here a collection of photos and statements from some of the Sarayaku women leaders who participated in and helped to organize the Kawsak Sacha launch. Statements collected by Osprey Orielle Lake and Sophie Pinchetti in Quito, Ecuador, July 2018. Photo credits and translations, Sophie Pinchetti. Sarayaku has fought off oil companies for 35 years. We have expelled companies from our territory, taken our legal case to the Inter-American Court and won. So this experience has well positioned us to present our Living Forest Proposal to the world. We, indigenous peoples, fight for our existence, not our extermination. We want our rights to be respected! Our proposal is a collective and unified effort of our people- men, women, children and elders – responding to the voice of the forest. Our proposal is not only for Sarayaku, but also for all humanity and all life on the planet. We've had to travel long distances from our territory, leaving our children and way of life, to bring forth a message and proposal for life to the world. We are all responsible for creating and sharing consciousness with our children and future generations. This is what we must do to survive. But we don't just want to survive and exist; we want to thrive. Kawsak Sacha is a proposal for life. The jungle is a living being with consciousness; it is made up of all the beings of the jungle. It is where our kallari rukuguna (ancestors) have always lived, it is where we live today and where all future generations will live, and where the protective beings of the jungle and all indigenous peoples will remain. In Sarayaku, the empowerment of women's leadership has already been very important, we have raised our voice to say that we women have the same possibilities to lead a people. I feel very proud to be at the head of the youth of Sarayaku and to take on this challenge as part of a people recognized for defending life, nature and the Pachamama (Mother Earth). The Living Forest proposal goes far beyond the demand of rights, it's about trying to reach the deepest consciousness of human beings, trying to see life in a different way and to see the integrity of conservation. Kawsak Sacha is about the essence of our existence as human beings and this planet Earth, and the beings that regenerate ecosystems and give life to the planet. The decision of the women of Sarayaku was a definite "no" to extractivist activities. We do not want destruction, we want to protect life. I think Sarayaku is one of the first instances in which women have participated so much in the processes and contexts of struggle, resistance and innovative proposals. Earlier this year, I received a death threat and denounced this to the authorities. I'm glad this process has encouraged many women leaders to denounce the threats they have also been receiving for taking a stand against the extractive industries. They are demanding respect for their rights, respect for nature, respect for women, this is a new articulation with very strong leaders of all nationalities. It is good that we are not afraid, because we are united. We have united to protect each other. We are going to continue fighting according to our own vision, because this strengthens the organizational processes of indigenous peoples, our processes of resistance and struggle, with grassroots actors coming with their own voice to say "this is what we want." Kawsak Sacha is for our well being, so that we can live healthily and protect the Amazon from harm. But when the oil company comes in, it will contaminate us. We women of Sarayaku are very brave, we are strong warriors. We will always keep our territory free from oil exploitation, because we live well in our communities, and we do not want the companies. We know how to cultivate all kinds of food and animals, we live according to our customs and we make our chacras [food gardens]. This is about an alternative proposal from the indigenous world, against the "development" that brings about the destruction of our Mother Earth. Our Mother must not be sold nor destroyed. Our Mother gives us life, and within it there are many lives and beings that cannot speak with a voice, this is what we are defending. We are presenting this proposal so that the government no longer destroys our jungle, so that we are respected as first peoples with own languages, customs and cosmo-visions. The government must accept our proposal. We don't want to suffer more abuses, more divisions. 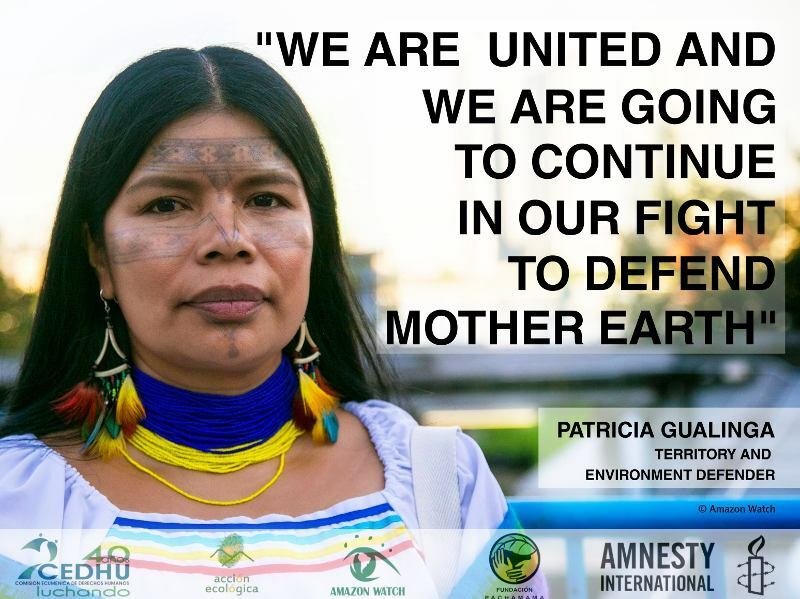 I call for unity among women of the world, indigenous and non-indigenous, we must unite in order to strengthen this fight to defend the lungs of the world. Global warming is making us suffer, the sun is getting hotter, our harvests are not the same as they were. So now we are raising our voices for the world to listen. The jungle is very important for everyone, not only for us. It gives us oxygen, and the rivers give us life. With a lot of strength, we women of Sarayaku are defending the jungle, Mother Nature and the river that we call Yacumama. We are protecting the beings that live inside the jungle, they also have the right to live in peace. There is no need to exploit the land for the world's vanity. The jungle is rich, it is not poor. The land is feminine, it gives us everything, it is our life and mother, Mother Earth. We don't need the company. Despite everything the company says, they contaminate. They contaminate peoples' minds and the value of the forest. Oil companies, mining companies and loggers want to exploit indigenous territories. We are presenting this proposal to the Ecuadorian government so that the territories of indigenous peoples are respected. For us, the Earth is a woman, our Mother Earth, Pachamama. As women, we identify ourselves with the land, because we are the ones who cultivate it. If we didn't have our territory, we wouldn't have a space to live, we would be totally dead. Having a clean environment to live in, free from contamination, means a lot to us women because we know that it is the legacy that we will leave for our children and the future generations. Kawsak Sacha is so important for our children and for our community. We don't want the oil and mining companies to come into our territories. We want the world to see how important Kawsak Sacha is because it is a living being with many spirits, animals, trees, and plants. We women have fought a lot to protect our territories. When the companies tried to enter our territory, we were defending our land with the children and youth. If the companies come, they will pollute our land and damage our culture, our fish, our rivers, the air – we will have nowhere to live, everything will end. Kawsak Sacha is our life, the living jungle is where we live and where our ancestors lived. Those in the city do not know how we live. Now there is a lot of contamination, our life is going to die. Sumak Kawsay ("Good Living") is going to disappear. We've been organizing for over thirty years and what we want is respect. We are being threatened. We have our territory, we live in our Pachamama, we have clean air and healthy land. We respect nature because we live with nature. We are connected to the spirit of the jungle through dreams. But when there is contamination, this connection is lost and the spirits die. Without them, we cannot be well, our children and future generations will no longer have this life. This was taught to us by our ancestors and we have passed this on to our children, who are now taking on this work through this proposal. As elders we feel happy to see this and we hope the government accepts our proposal. Through the Living Forest proposal, we are giving a voice to the forest. We are the ones telling the governments that we don't want oil companies in our territories. We are the voice of the forest. Women have so much strength in them. Women have always been on the frontline fighting for their territories because we have such a deep connection to the Pachamama and the forest. Kawsak Sacha is important because it is something we have always lived with despite the Western world not recognizing it. We want others to understand, recognize and feel that the jungle is not just a jungle, it is full of life, and humans and nature can share and exchange together. Without this life in the jungle, indigenous peoples cannot exist. From generation to generation, our ancestors have passed onto us the knowledge that the lagoons, mountains and big trees have protective beings. Few people can see these beings, the shamans are the ones who have had contact with them and who have transmitted this knowledge to our peoples. Now it is the time for us to transmit what our wisdom-keepers knew, and what we also know and recognize since we live in the Living Forest. It may seem like the power and leadership of women has been invisible. But it has been around for many years. The woman is the one who decides many things – how to educate the children, how to keep the gardens, and she is the one who decides the most for the care and protection of nature. Lately, women are the ones who have been fighting on the frontlines but without leaving our partners the men behind. I think the persecution of woman leaders has become an objective of the companies. The oil companies want to find a way to enter our territories, but since they haven't been able to so far, they're starting to target the women, trying to scare and terrorize them. And this is the case for many different nationalities, Waorani, Kichwa, Sapara and Achuar. It is a psychological persecution. I hope they don't go further. We are uniting more and more to show that we are not alone.